Having young people be heroes has always been possible in a ‘normal’, though somewhat fanciful world: series such as The Secret Seven and Swallows and Amazons. In these, Enid Blyton still had functioning adults in the background, even if they did not form part of the adventures. The more modern offerings appear to paint worlds in which the adults have lost the plot and the young people have taken it upon themselves or are charged with the responsibility to find solutions. This is the case in The Hunger Games, the Divergent trilogy, the Matched trilogy and even in the Harry Potter series. At least Harry Potter and his friends receive training in survival skills from some of the adults around. 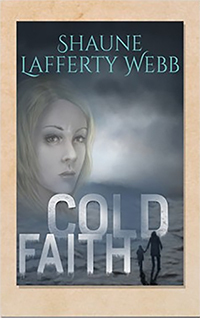 With Cold Faith, Shaune Lafferty Webb has joined this genre with a twist (no spoilers from me). She paints an extreme, and extremely bleak, landscape and peoples it with individuals and groups who have nothing to be joyful about. At the centre is a small number of characters whom we follow through the quest that is the substance of the story. Not all of them make it to the end. Webb is very clever, and successful, in having the world she describes be mysterious and giving the reader only occasional hints about what is really going on. This brings us very close to the characters, who also know only part of the ‘truth’, if they know anything at all. These characters are sharply drawn and we learn as much about them through their actions as through the author’s description. They are people we can empathise with or hate or barrack for. The environment is also an essential character and it seems to continually pit itself against the humans. For the majority of the book I thought that this was in part a cautionary tale about what we are doing to the planet we live on. Perhaps it is, although the revelation at the end of the book puts a very different slant on this idea. Cold Faith is a fine observation of how people respond to dire circumstances and how they do so in different ways. The title itself is a clever allusion to one of the central characters. In this, Webb explores what happens to people who have limited information about their world and how that world adheres to their central beliefs. Like all good speculative fiction, Web has placed very human characters into a world very different from the one we are familiar with and then allows us to observe how they cope, or don’t cope, with this. We, as readers, can be sympathetic or judgemental about how they respond to the situations they find themselves in. This book is not just for young readers; adults can also enjoy it and be challenged by it. I look forward to the promised next instalment of the series, wondering what Webb will do with the knowledge imparted to the main character. How is he going to use this information as he continues his quest for what may save him and those he feels responsible for?